Courses available from the School of Omni UK. 'Make a career out of healing'. The main benefit of having accredited healing courses is that YOU can then get insurance. Beautiful country location just 13 miles north-west of the market town of Carmarthen in West Wales. Malindi is in a beautiful part of West Wales and you may wish to take your time to explore this friendly area whilst here on a retreat, relaxation half day, workshop or course. There are several ways to stay e.g. tipi, yurt, bed and breakfast, guest house, hotel, working- farm, quality accommodation or even a riverside campsite............. you decide which. From Carmarthen take the A484 signposted to Cardigan and Newcastle Emlyn. Cynwyl Elfed is 8 miles Then take B4333 from Cynwyl Elfed for 5 miles, look out for brown tourist signs on the left directing you to Malindi. Sat nav DOES NOT get you to Malindi CentreIf you are using Satelite navigation (sat nav) then please be aware that some systems lead you 2 miles away from us! 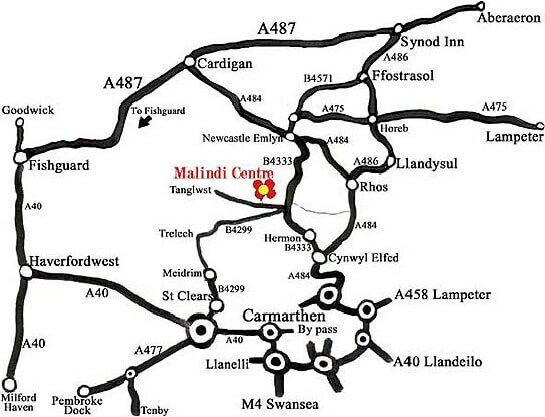 Simply set Cynwyl Elfed as your destination as we are, as said above, easy to find from there.